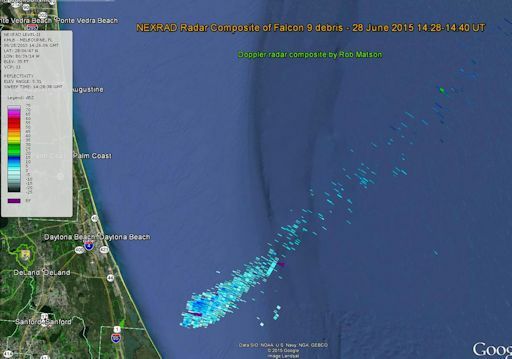 "Figuring that the debris cloud would likely show up on Doppler, I pulled the NEXRAD data for the Melbourne radar," says Rob Matson, who created the graphic. "High altitude (21.5-km) debris first appears a little after 14:28 UT (10:28 am EDT), which was a little less than 5 minutes after the failure. This image is a composite of 29 sweeps over a period of about 12 minutes." "I figure debris will starting washing ashore near Daytona in the next day or two," he adds.